"Silsila" is a 1981 hindi film which has Shashi Kapoor, Amitabh Bachchan, Jaya Bachchan, Rekha and Sanjeev Kumar in lead roles. 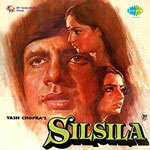 We have 6 songs lyrics and 6 video songs of Silsila. Shiv-Hari, Hariprasad Chaurasia and Shivkumar Sharma have composed its music. Lata Mangeshkar, Kishore Kumar and Amitabh Bachchan have sung these songs while Javed Akhtar, Hasan Kamaal and Harivansh Rai Bachchan have penned its lyrics.